Heavy storms that erupted recently left at least eight families stranded in Zeerust town and Ikageleng Township. Frightened residents of Zeerust could not believe that they survived the heavy storm that blew away the roof of their houses, chopped down trees and broke 15 electricity poles and cables that fell across the roads. Meanwhile, the Ramotshere Moiloa Local Municipality Electrical Department worked tirelessly throughout the weekend to restore electricity supply with assistance from Eskom.The Oppietoppie water destribution center for Zeerust also experienced problems but the municipality‘s water and sanitation department dealt with problem with immediate effect. Administrator, Paul Maseko also dedicated his time to give moral support to workers who have been on sight from Friday. “I kept on communicating with the team on the phone but I felt like I was not doing enough so I decided to go and experience what they were going through. They appreciated my support and I would like to applaud all those who did not rest and gave their all to restore the situation. 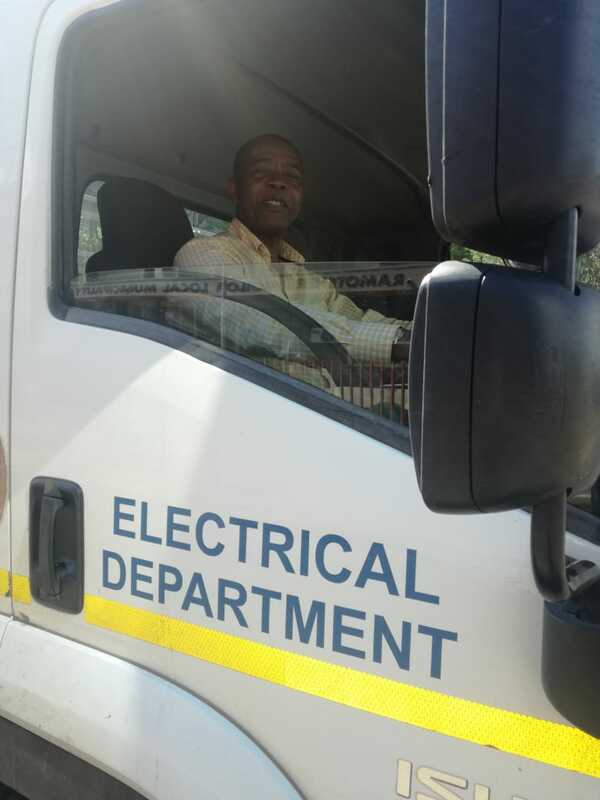 Nothing beats teamwork”, said Maseko who was behind the wheel of the electricity truck. The municipality worked together with Eskom, the Department of Local Government & Human Settlements and Ngaka Modiri Molema District Municipality to assist with temporary structures to at least eight families that were affected as well as to clear the roads. Other government departments like SASSA and Social Development are expected to do their assessment and provide the necessary assistance.